The R. Kelly freakin weekend song played in my hot yoga class this morning, except a softer cover of it and I was so distracted by all the sweat dripping down my face and into contacts AND my all consuming love for my new yoga towel (bought $20 off at my new yoga studio boutique sale; that "free" first week ended up costing me a lot of money, but all on things I was planning to buy... just maybe not all at once. (Ahem, Lululemon yoga mat. But it was also on sale and I LOVE it SO MUCH it was almost too distracting to use in yoga the first few times. It's made of sticky yoga magic and I LOVE it.)) that it took me until nearly the end of the song to figure out why I could mouth the words even though I was certain I'd never heard it before. [Side note: remember when I was done buying any more leggings? Well I was leaving the studio, all zenned out when I got distracted by a sign reading "75% off" by a basket with pants I'd been eyeing every time I passed them in and out of the studio- I'd been so strong- and then here they were in my size 75% off. It was a test- one I clearly failed, or maybe passed, but what kind of budgetary monster can say no to $70 pants for $17? But back to the freakin weekend because it was! Assuming "freakin" is good, right? It was a good weekend. But first we go back to the week and some blogworthy moments I missed while taking screen shots of heart rate charts. First up, Cora got a new nightgown. Every night when the girls go to bed, no matter how much they've hugged and played and brushed each other's teeth (we've nixed that, for the record) mere seconds before, Cora yells, nearly panicked, "YAYA HUGS!!! YAYA! HUGS!!!!!!". We've learned she's quite capable of saying "Claire," but "Yaya" is Cora's preferred name for her beloved big sister, much like "Yandon" was Claire's pet name for Landon until she oh so sadly dropped it a year or two ago. And so Yaya hugs are given. They take a little while and genuinely don't seem to be a way to delay bedtime- Cora LOVES to sleep- she just also needs a lot of hugs from her Yaya and Yaya doesn't seem to mind. And while Claire and Cora are fast friends, Claire and Landon remain the original dynamic duo. Particularly while Cora is taking her marathon naps. But mostly all 3 of them play together. Landon is the worker bee- he sets things up and does just about anything involving work. Claire is in charge- she sets the rules of play. Rules that frequently change depending on how they effect on Claire at any given time. Cora is cheerleader- thrilled to be there and part of whatever is happening. Earlier this week they decided to play baseball. They've never played on a baseball team or seen a baseball game on TV or in person, so I have no idea what they're basing their rules on, but a game was quickly arranged with Landon pitching, Cora fielding (backwards, but enthusiastically so), and Claire at bat. She missed all 8 pitches, set her bat down, and yelled, "Okay, it's time for my HOME RUN!". Then she threw a ball at Landon and ran in a circle around the magnolia tree behind him. Nailed it. And now to the weekend- I went back to Orangetheory Friday morning to remind myself after 8 yoga classes in 7 days (free week!) that I could still run. It was an endurance day, so I'm definitely all clear on the running thing. Then yesterday I taught the most fun barre class. A bride and her girlfriends were apparently having a bachelorette girls getaway weekend in Fort Worth and found their way to my class on Saturday afternoon! It was SO fun and so high energy and everyone was dripping in sweat when they left in search of a brunch 1.25 hours later. I pointed them to my favorite place on Magnolia, while they all reassured themselves they'd earned at least 3 mimosas. I live to serve. Later that day we took the big kids to the final play of our wonderful Casa Manana children's series - The Seussical Musical. It was a great play and we all loved it, as we do every play Casa puts on. We're so lucky to live a few miles from such a great theater with a dedicated children's series every year. Cora stayed home with our nanny, and unbeknownst to us, Landon left her with some strict instructions regarding his baby sister before we left. When we returned, we dropped the big kids to join Tara and Cora, who was clearly well cared for and screaming deafening screams of joy and welcome, so we could go out on a date. We accidentally ran into Brewfest on West 7th. Just like every time we stumbled upon South by Southwest in Austin, we only do cool things when it's entirely by accident. We enjoyed live music, fabulous people watching, and a great meal with even better beverages. I took a picture of us, but this picture of my food is far more interesting. Those fries were amazing AND they didn't have wrinkles around their eyes. Today was hot yoga, a bit of grocerying, and spectacular weather. Unfortunately it was also the day we had to work on Landon's science project. Last week he excitedly told me that "Mom, I got the BIGGEST board they had!" - JOY!, but it actually went much better than expected with only two moments of utter defeat and a few tears. Some of them his. I believe strongly that kids should do their own projects and school work and I felt the pain of that belief while I sat on my hands and watched him SLOOWWWLLLLYYYYY and painfully hunt and peck his way around my keyboard to type up his hypothesis, procedure, materials, observations, and conclusion. Several lifetimes passed me by in which I contemplated our anti-electronics stance, but oddly, my single glass of wine was only just finished when he was through. I helped with some ideas for layout and then he did the gluing and cutting and placing of carefully selected foam stickers and hand-drawn art. He's quite proud and he should be. And next year, he excitedly told me, he gets to do the history fair too!! Yay! One of my big initial attractions to Orangetheory, besides the novelty of running in a group class and the fact that it was clearly a REALLY good workout, was the fun of seeing my heart rate and calorie burn up on the big screen. Math and numbers and charts are my favorite things and combining them with exercise made me very happy. I started going to barre about 3.5 years ago. I loved it immediately, got pregnant and disappeared for a while, and then came back with a vengeance at 6 weeks post-partum, attending class 5-6 days a week for nearly two years. I never had any real idea how many calories I was burning or what my heart rate was doing, I just knew I lost all the baby weight and dropped a pants size before coming back to work at 12 weeks and generally felt the healthiest and strongest I'd ever been. That was a very freeing thing- working out because it made me feel good- both the actual work out itself and the afterglow while shopping for new clothes. It's why I teach barre now- I truly love it and find it a powerful, beautiful, fun, seriously effective workout that I LOVE sharing with others while cheerfully yelling at them to do side planks. also, the pants. I love the pants. But numbers are fun. In Orangetheory you can rent a heart rate monitor for $5 a class or buy one for $59. Since I was hooked after one class and have a personal passion for charts, I decided to buy one, particularly after finding out I could use the monitor and their app to track my heart rate outside the studio. And so I've done precisely that, tracking my heart rate in every workout I've done for the last two weeks. I even accidentally ran the whole monitor and strap through the wash after a hot yoga session on Sunday and it kept on trucking. It knows it's doing this for SCIENCE. And while the numbers aren't important and you should do things because they make you feel good, etc, etc, let's look at them anyway because I made a chart! I learned that for a 60-minute workout, nothing is going to hit as hard as OTF. It's high intensity interval training and you run flat out in intervals for about 30 minutes and spend the other 30 doing cycles with heavy weights, TRX bands, and other strength work. 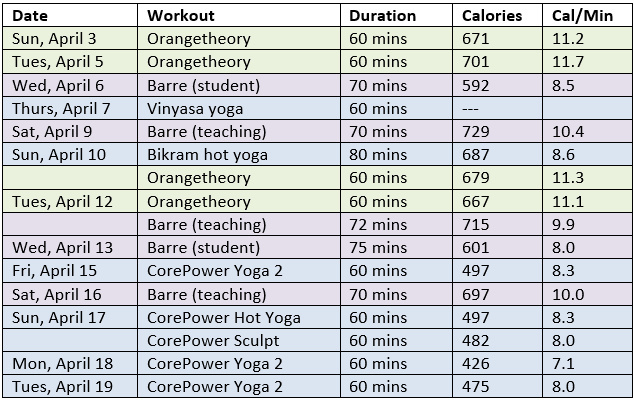 I don't know that I could do it more than 2-3x a week, and you're missing out on the core work, stretching, and toning of all the supportive muscles that you get in barre, but it's definitely filled a cardio hole in my routine- look at all that time in the orange and red high HR zones! no other workout I do gets me there- and it's really fun. Luckily, for something I've been doing near daily for two years, barre is also a great workout! This was my chart as a student. It's nowhere near the high heart rate orange and red time as OTF, but still a great workout and since I remember that class vividly because of a seemingly endless series in chair pose at the barre, I know all my muscles were shaking- things were happening!- and I remember looking at my phone and being shocked my HR was still in blue. So it's a nice reminder that you don't have to be panting or have your heart pumping out of your chest to be building muscle, changing your body, and burning calories. All that said, WHOAH teaching is even better workout. I knew this because despite being in really good shape I nearly died the first time I taught- like heart exploding, lungs/throat closing, vision going dark, hmm I wonder if anyone in this class knows my emergency contact info kind of near dying. It's a whole new thing to do a class while narrating, explaining, and counting the entire time, all over the sound of your early 2000's club music. Man do I love it. Bikram yoga was a surprise to me. I go on Sunday mornings because it's my detox- my mental and physical challenge to stay in a 106 degree room for 80 minutes and move and meditate and wring everything out. I feel amazing when I leave and would continue regardless, but it was helpful to see that even if I eat nachos all week, I don't need to skip my sacred mat time in lieu of something more seemingly hard hitting and it's not just the heat that makes it feel intense. So it's been super fun and maybe a little addicting to track my heart rate during my classes. Much like new pants, a new mat, or a new studio- anything novel that helps get you out the door is a good thing, and for the last two weeks, knowing I'd get to check my phone at the end and see my heart rate chart was highly motivating. And the results revealed what we already knew- all workouts are good workouts and the most important thing you can do is find something you enjoy and that you'll return to. That said, they do vary quite a lot in how much they work your hurt and get calories burning, so if your goal is to lose weight or improve cardiovascular health, you're going to want more cardio than barre or yoga can give you (unless maybe you're going to teach a class!). For me personally, the charts tell me that I'm definitely filling a cardio void with OTF. And my body tells me that OTF, for all its seductive big numbers and orange and red bars in the bar graph, doesn't give me the core and supporting muscle work I get in barre or the stretching, balance, and meditative work I get in yoga. It's all important and mixing it up keeps it fun. I'll probably stop recording my workouts, except for OTF and maybe when I teach barre, just because those are fun to see, but the novelty gave me a boost to do some extra classes over the last few days and I'm grateful for it. Just as I'm grateful that my one free week of unlimited yoga has me reconnecting to my mat in a way I hadn't in months. So, that's more than you probably ever wanted to know about what my heart has been doing for the last 16 days, but if you wanted to know more, ask away! Every night I sit down and think I have so many things to discuss with you- Big Thoughts on blogging and why I'm still doing it (you know, except when I'm not, like all of last week) and when I'll stop. Career Thoughts. Three terribly overdue letters to the kids. My New Year's Spring Time Resolutions. My Fitness Science Experiment. But I also had to read three new books (April has been an EMBARRASSMENT of riches from my favorite authors with a new book in my favorite series out every week) and I worked out every day (and accidentally twice on Tuesday) and James and I had to dress up and eat delicious food Thursday night to celebrate the 3rd birthday of his swim school. And I discovered a bunch of new online shopping sites I had to explore. And then Wills and Kate went on a tour of India and Bhutan and I had a LOT of clothes and pictures to review and approve. It's been a terribly busy week. So instead of talking about any of those things, we're going to hit it with some pictures and a general recap so I can go to bed and recover from the 3 hours of sleep I gave myself on Wednesday night when I had to finish JR Ward's The Beast because I lack self control and an understanding of how books work. (The book was good, by the way, though I almost stopped reading when I saw she'd written a hashtag into the narrative. Because apparently that's how people think in their own heads now. They think in hashtags. In the middle of important self-realization inner monologue moments. It's a good thing her character building remains strong. #NOHASHTAGS). I typed that last night and then gave in to fatigue, put my laptop away, and curled onto James's lap to watch Spring Holiday Baking Championship before an early (for us) bedtime of 11:30. I have no regrets, but it's messing up my references to "last night" and other days in the past. Back to Monday! I took this picture while the big kids were at swimming. It's maybe the most important picture I've ever taken. It just captures Cora's intensity so well. She's loving it and letting it go (Let it goooooo). You have to close your eyes to channel Idina properly. Cora's just a bowl full of joy these days, which, as that wonderful and awful Facebook "On this Day" app keeps reminding me, is pretty much she's lived every day of her life so far. Kills me. How can so much joy and love and JOY fit in such a small package? On Tuesday I did my Orangetheory workout on the way home from work, per my new routine that I love. Tara gets the big kids and Cora and they all hang out and play until I'm home at 6. It's a little later than usual, but now I don't have to go back out for my usual late night workout. So I can pour a glass of wine, make a dinner I'll actually eat with everyone, and just generally enjoy a lazy evening knowing I already ran my heart out for 30 minutes and burned 700ish calories. But this Tuesday, just as I was walking in the door, a fellow barre teacher texted, desperately seeking a sub for her 7:15 class. And so I found myself peeling off one set of sweaty clothes, putting on some crazy leggings, and heading back out the door at 6:45 to teach barre on shaky legs and an empty stomach. But it was a fabulous class and I burned another 700 calories (I am deeply enjoying using my OTF heartrate monitor in all my workouts) and stopped at Kroger on the way home at 8:45 to buy wine because by then that's all I wanted for dinner. (Though I did eat real food too because James said I had to.) I took a scalding hot bath, lay about the couch like a limp noodle, and finished the new Mercy Thompson book. Thursday was normal and boring until it was 7:00 at James and I turned ourselves into fun, fancy people who eat out at expensive restaurants in the middle of the week as if we don't have budgets or small children! It's my favorite kind of transformation. We were celebrating 3 years of The Fort Worth Swim School. He started it right after I found out I was pregnant with Cora and now our little bunny is there every Thursday taking lessons! He's done so well and it's been such a happy surprise to discover how fun it is to be a service-based company in a small town. We rarely go anywhere without running into a client (barre or swim!) and I love it. I also loved every bite of four courses of decadent food at the always fabulous Grace. I love all minutes spent with James, but I think I like our rare fancy date night minutes the best. On Friday I tried a new workout studio- Core Power Yoga and it was AWESOME. It was a small class so I got to push myself a little more in new poses I wouldn't normally try in a big group, including Bird of Paradise which felt fun and very powerful. The me of 4 years ago still can't believe I get so excited every time I see a new studio, but new student specials are the best and I love finding new ways to feel strong. But even more important than Bird of Paradise (modified, I should note, my top leg is quite bent when I do it)- we got speakers installed on the back patio and in the living room ceiling! The final step of our back patio update and I am SO excited. I love music playing at all times and I no longer have to carry my bluetooth speaker around the house with me or wonder why I can't hear the person I'm talking to on the phone because their voice is being piped through the speaker in another room. These are hard wired in and run off an app that connects through the wireless network. You can play something different in every room, or drag and drop them together to play a playlist curated from all internet streaming services, your own music library, and/or that of anyone else on your wireless. It is so awesome. Other than the fact that James and I are about to spend SO much time arguing about music. It is the one thing on which we are completely and utterly incompatible. The chaise lounges I ordered also came in (yay Wayfair!) so we are READY for summer. We just need the pool temp to get above frigid (the one downside to a super shaded backyard) and we're ready to party. Can't you just see a pitcher of margaritas on that little table? And not-children in the chairs? It's going to be great. Until then, we have our fierce 3-square games and the giant boxes the chairs came in. Off to teach barre and stop by the Superfun Yoga pop up because I wore my old rainbow paints to rags and there's a new rainbow pattern calling my name! First off, THANK YOU for being so generous in your skincare recommendations. I'm still digesting them and as a first step, have made an appointment with a medical and cosmetic dermatologist suggested by a friend. Unfortunately, her first opening isn't until the end of June, but I suppose that gives me time to use up the products I currently have and start getting in the habit of basic steps like washing my face and drinking water, so I can be honest with the doctor when I tell her yes, of course I do those things. Second, I had this burger at Rodeo Goat on Thursday and it was so amazing, I actually removed the beef patty after the first bite and never looked back. Which maybe means it wasn't even a burger anymore, but whatever, it was DELICIOUS. It was like a twice baked potato, smooshed flat and fried, in bun with a fried egg, cheddar cheese, and patty. For the first time ever I ate my burger before touching my fries and then didn't even finish the fries. This has never ever happened and is a testament to the glories of the Spudnik burger. If you live in Fort Worth, go get one. Third, James competed in a swim meet today in Dallas (he won all of his events because he is a stud muffin) so it was just me and the kiddos and a babysitter making our day work between my barre class, taking Landon to a birthday party and then to his Zoo Nature Club meeting and back again. But my favorite part was post-barre and pre-Landon-pickup, when it was just the girls and me. Landon is an amazing big brother and loves the girls so much, there is almost never a time he isn't in the middle of any playing they're doing. So with him away, I got to see the girls alone and it was so adorable. At one point they were both wearing tiny backpacks and wandering all over the house. Then Claire set up shop right next to my feet to do "work" on her laptop just like I was (and by "work," I mean I was buying an adorable top online at Banana and researching chaise lounges to order for our by the pool). Cora sat right down next to her and was then happy to just chill, sitting with her sister, waiting to see what they'd do next. Love it. Once we were all reunited around 5 we decided to order pizza and a movie since we made the kids miss the movie night at their school on Friday because it didn't start until 7:30 and we always have the kids in bed at 7:45 because James and I really enjoy not parenting after 8 p.m. and see no reason to change it. So tonight we watched the 1993 classic "Blank Check" and the kids LOVED it, even if they were very concerned in the beginning that the bad guys would catch the kid before he could spend his million dollars. They didn't quite seem to realize the whole premise of the movie required that to not happen 7 minutes in. Fourth (fifth? ), I got to "meet" a whole group of the far flung "Moms in Law School" bloggers I've been reading and emailing and commenting with for NINE YEARS without ever meeting in person. They had a mini reunion in Denver and I couldn't make it up, but I got to Skype (by first creating a Skype profile; I've entered the 21st century you guys) and see them and chat with them and it was so great! Faces with fake bloggy names, I now have them. And finally, if you are still feeling chatty after all our talk about retinol and botox, I would love more dinner recipes to add to my rotation. Except its not a rotation because I rarely make the same recipes twice even if I like them and I don't know why. It's actually kind of like the skincare- I'll try something, like it, and then turn back to google to find more things to like because maybe there's something out there I can make that's even better? That and I just get bored of everything I make kind of immediately. But I'm trying to rekindle some old favorites and keep my brand new recipe adventures limited to two meals a week. That said, I'll totally break that new rule if you recommend some good ones for me! To start, here's last week and this upcoming week's menus for your own dinner idea enjoyment. The veggie lasagna is a recipe I got from my sister after we visited because it was by far the best veggie lasagna I'd ever had. Too often they rely on mushrooms (ew, no, never) or just way too much cheese and this one did neither. Everyone in my house loved it and we did not have the leftovers I felt certain we'd have. I typed out the recipe at the bottom. 1. Drain tomatoes in fine colander in sink until most of the liquid is gone. Place in food processor and pulse until smooth texture with some rough chunks. 2. Heat olive oil in a skillet. Saute garlic for about a minute, until it begins to brown. Stir in white wine and tomatoes. Add oregano, basil, and salt. Partially cover to allow steam to escape, cook approximately 10 minutes. Adjust seasoning as needed. 1. Prepare Elemental Tomato Sauce and set aside. Saute the onions and zucchini, then add and wilt the spinach. Stir in the tomato sauce and keep warm on a low burner. 4. Spread a very thin layer of the vegetable filling in the bottom of a 9x13 baking dish. Place 3 noodles over it, then use the bag to spread 1/3 of the ricotta mix over the noodles. Add a layer of 1/3 of the vegetable filling, then top with 1/3 of the mozzarella cheese. Firmly press down on the cheese with a spatula to compact the layer before the next. 5. Repeat the layers twice more in that order: noodles, ricotta, vegetable filling, mozzarella. 6. Bake uncovered at 350 for 45 minutes. Let stand 10-15 minutes before serving. So remember about a year ago when I had a makeup person teach me how to do things like put on makeup? 14 months later I'm still using the exact products my makeup artist recommended and while it was a little pricey buying everything initially, I have not bought one single other makeup item in a year because everything I bought on my birthday is perfect and I don't need to buy random stuff in hopes that this ONE new eyeliner is going to be the eyeliner that tells my brain how to put on eyeliner. I have one thing in each category that works for me and I just restock as needed. Now I need the same thing for skincare- someone to just tell me what the best thing is so I can buy it and use it everyday and stop wondering if there's something else I should be using. Because I took a selfie with Cora on Monday and nearly had a heart attack when I looked at it all blown up on my computer later. You guys, I just turned 33, what the FCK is happening around my eyes? are those wrinkles in my dimples? why are my eyes puffy? why do I look so tired?? I wasn't! That was Monday night, the evening before the new JR Ward book downloaded on my phone at midnight and I accidentally read it until 3 a.m., giving me 3.5 hours of sleep before my alarm went off. THEN I can look tired. This was after a better than normal 7.5 hours of sleep yet I literally yelped when I looked at myself. So. Skincare. Also probably hydration because I go whole days without drinking water and technically know that's bad but just genuinely never feel thirsty, so I'm working on force hydrating myself. (It's going okay. I have a 40 oz. hydro flask water bottle that usually takes me 2 full days to drink dry. Sadly, this is an improvement.) But let's focus on things that involve even less effort- what can I buy to slather on my skin that will make everything happening around my eyes go away? Can we make my face less puffy? Can we just brighten and tighten and freshen it all up a bit? I need a daily regimen. If I invest in it, I'll do it. What do you do? Love? Tried but didn't love? What are serums and do I need some? Where do they fit in the skincare routine? Do you use a different night and day cream? What ingredients should I make sure are included? Retinol? Vitamins? I am not anti-chemical. Do you use an eye cream? While I have googled the crap out of these questions, the end result is inconclusive and I've decided to turn to real people instead. A bit of background- I have slightly dry, never oily, generally very clear skin. Because I was terribly spoiled with skin that never broke out, I didn't start washing my face regularly until... oh maybe a year ago. I've slept in makeup way more often than not. I put on lotion on nights I wash my face, but never use an eye cream even though Sephora has given me samples of three expensive ones. I'm never sure if I'm supposed to wash my face in the morning if I washed it the night before, or whether I'm supposed to put on lotion first in the morning or just start with my makeup. I have never used a mask and have no idea where that fits in. I currently have philosophy's Purity Made Simple and philosophy's Microdelivery Exfoliating Wash as face cleansers and like them both. I also have the Algenist Rejuvenating Cleanser in sample size and LOVE it and may switch to that as a cleanser when my philosophy's are gone. I use the Oil of Olay Regenerist Serum in the mornings and the Oil of Olay total effects anti-aging night cream when I remember. My favorite makeup remover to date is the Dermalogica precleanse. I mostly need (detailed!) moisturizer recommendations (and serum explanations) though I welcome any and all input. What's your regimen? What do you love? Please help me take selfies with my toddler that don't make me sad. The frowning just adds more lines. Now that I'm not on vacation and or home all day dying of the flu, the blog posts have slowed down again. Actually, the real reason is because I discovered Season 3 of Orphan Black is available on Amazon Prime and we've been watching 3 shows a night to devour it as quickly as possible so I can get back to complaining about having nothing to watch (after doing the same with Season 4 of House of Cards- very good by the way, the first season to come even close to the glories of season 1), particularly now that I'm finally going to stop hate watching and recording The Walking Dead because omg that is the worst written show in the history of shows and it's finally fallen so low (THAT FINALE!) I can't even watch it just to see how they find a new camera angle to shoot zombies eating viscera. We're halfway through season 2 of Daredevil and it's pretty good, but not as strong as Season 1 (clearly, since we didn't think twice about interrupting it to binge on Orphan Black, which is just a Tatiana Maslany love fest- oh my GOD is she an amazing actress. Season 3 hasn't been quite as strong as 1 and 2, at least not until these last few episodes at the end, but I will watch her switch between versions of herself for hours because she blows my mind.). That was a long intro- I need to do a post on TV- but first, the weekend! This time around it was fever free and so much more fun! It started with my return to the barre on Saturday. I tried to take it easy, pausing a lot to check form and not even trying to do most of the workout, but I still regressed to my throat-closing-blacking-out thing that happened the first time I ever taught. I think it has to do with talking out loud while exercising and forgetting to take deep breaths. So I remembered and it got better, and it actually felt wonderful to be back in the studio, but it was crazy how far I felt like I'd fallen in my endurance and lung capacity. I spent the afternoon lounging on the couch bothering James while he was trying to get work done, which reminded both of us very much of college (he was very studious and diligent, I was more of a skim the chapters the night before the test girl), and enjoying listening in on the kids and their games. The weather was beautiful I googled my way to a new restaurant on the Trinity River that promised an outdoor patio and play yard, fabulous burgers (goat cheese and bacon jam! glorious! ), and what turned out to be a new entry for my Top Five list of favorite french fries (there's so rarely a shakeup at the top, it was quite exciting). Plus an adult beverage I don't remember the name of, but involved mint leaves and watermelon lemonade and something fizzy and maybe gin? It was delicious and pink and I loved it. The kids ran around in the play yard area, James and I lounged in the shade, and we capped the whole thing off with a family trip to Target because it just felt right. And we decided we needed more patio furniture to go with our newly refurbished patios. but doesn't the deck look nice? On Sunday everyone slept in and I ran off to Orangetheory because I'm trying to use up the 4 classes/month pass I bought before I went on an 8-day road trip and got the flu. I did pretty well during the weights and then felt my flu recovery on the running, but I was good and didn't let ego win- lowering the treadmill speed to a walk on the slower intervals and generally not killing myself. I felt very adult and responsible. The kids had a birthday party at a bounce house place, so I changed and met everyone there. Cora, after yelling at the bounce houses at our last party, has now decided they are the great love of her life and bounced her heart out, totally holding her own with kids twice her size. When we got home the kids all played outside (we're there! we're finally at the "hey kids go outside and play while I make lunch" phase with all THREE of them! everyone in our house is so delighted by this, particularly Cora. and me.) and Cora bounced on our mini trampoline one million times, ate her lunch, asked to go night night, and then took a 4.5 hour nap until we finally woke her up because we missed her and wanted her to play outside with us before dinner. And oh that was the best part of the whole weekend. I'd run a few errands during the endless nap time and decided I needed to make a pitcher of white sangria because a character in a book I'm reading had made some for a dinner party and it sounded delicious. I googled a recipe, ran into Sprouts to grab the necessary fruits, and made a pitcher just for me when I got home. I love being a grown up. The kids played an intense game of four-square (three-square?) with James. Cora rode her bike and flung herself down the slide on repeat. I turned on music. The weather was so spectacularly beautiful. I floated between everyone, enjoying my beverage, singing to my music, lounging in our new patio chairs and just generally feeling like everything in my life has led me to this exact moment- a perfect afternoon and evening with my kids, all of whom can play independently with each other and yet still love playing with us. We grilled out Italian chicken breasts and veggies, with a simple herb pasta and french bread and brownies with chocolate frosting for dessert. It is so nice to not have the flu. It will be a long time before I take a 98.6 degree temperature for granted again.